We’ve recently added to the Aldrock family. We’re pleased to welcome Architectural Design Technologist, Luke Broadhurst, to our architectural department where he’ll be working alongside Gary, Paul, and James, dealing with aspects of architectural design. Luke completed his degree in Architectural Design and Technology BSc (Hons) with first-class honours. He was the best candidate interviewed by far and it shows: although Luke joined us this summer, he’s already made a huge impact within our team. With the new addition we’re able to offer our clients even more of a dedicated approach to architectural design, as well as additional expertise and experience. Luke has a keen eye for detail, and is exceptionally adept at using Revit modelling and AutoCAD, and has quickly adapted and settled into the team. He has a strong sense of design awareness, and a comprehensive understanding of traditional and contemporary technologies employed in the construction process. Architectural design technologists are specialists in the science and art of architecture, they form the link between concept and construction, providing high-level design skills in projects of all types and scales. They have a strong sense of design awareness, a comprehensive understanding of traditional and emerging technologies employed in the construction process, and are skilled in the use of sophisticated and powerful information tools and techniques. They possess great knowledge of the architectural design process. The role itself requires a professional and technical aptitude, as well as presentation and communication skills – after all it’s important to us that our clients understand our design processes, rationale, and the technology we use. Along with learning the scientific and technological aspects of construction and facilities, an architectural design technologist will possess knowledge about the practicalities and legalities involved in constructing and managing. The use of digital tools and technologies form an important part of architectural design of the modern age. 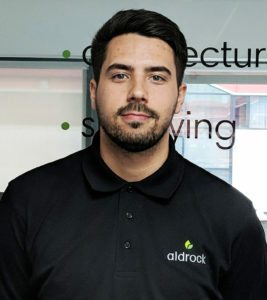 At Aldrock it’s important that we hire the right people in the right places, who can inspire both the wider team’s creativity as well as the imagination of the client, so much so that they can execute and bring ideas to life. If you’d like to bring an architecture project to life, contact one of our experts, today!